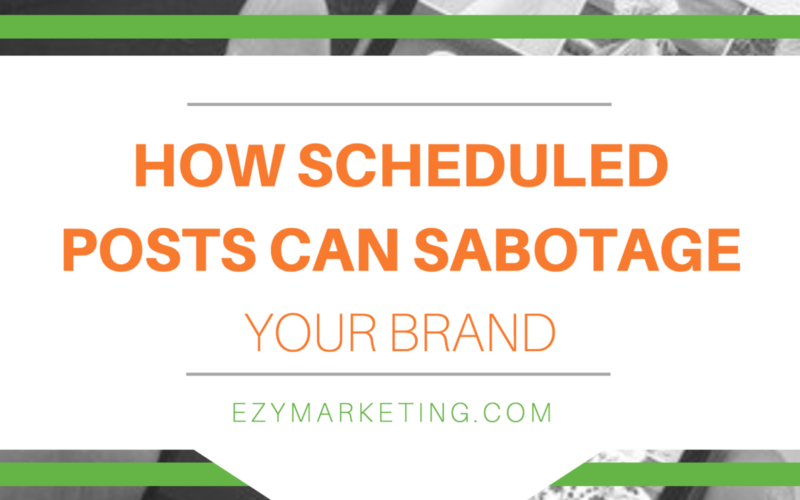 As social media experts, you will generally hear us telling you that scheduling out your posts in advance is an excellent idea. And don’t get us wrong, it is! Scheduling posts on social media in advance can save you tons of time and ensure that you always have relevant content, regardless of your busy schedule in the moment. If you do anything with social media, you should consider mapping out a calendar plan for the month of social media posts. However, there is a caveat to this rule. You MUST pay attention to current events and adjust your scheduled posts accordingly. Nobody wants to read about how happy they’ll be on a summer vacation when a natural disaster has just occurred. Or maybe you’ve scheduled a post about registration for an event that has since been cancelled due to inclement weather. There are any number of situations in which your post could turn off our audience, or worse, anger them. We have seen this in a number of situations, even with very large brands that have a huge following. Always be aware of the posts you have upcoming for the week and pay attention to their intent and message with regards to current events. The power and convenience of social media scheduling is an important tool in this industry, but it must be used with a hefty dose of common sense and sensitivity to your audience. If you pay attention to what you post and what you schedule, and make adjustments as you go, you’ll develop a well-rounded and trustworthy brand that will secure your audience’s loyalty.